N-Sci and the team are still in the running for a possible award from the 04 NASA/ROSS ASTEP Program. Announcements are expected soon. The team will submit an updated version of the SPELEOSCOPE in response to the current NASA/ROSES opportunities, ASTEP & ASTID. 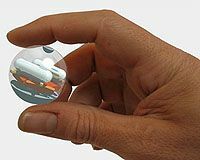 The Mothergoose exploration concept (illustrated right) is intended to emulate the activity of a human field biologist in performing site selection and investigation at increasingly finer spatial scales from aerial views down to the microscopic. 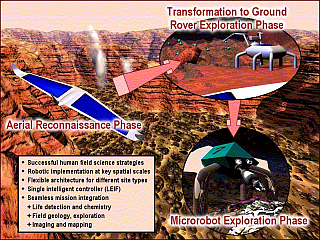 Shown here are three phases: aerial reconnaissance, walk about exploration using a ground rover, and microscopic examination using microrobots. The N-Sci MOTHER GOOSE/MGL Team are preparing responses to the current NASA ROSES opportunities. Several technology areas are of interest: Rover Technology, Navigation, Advanced Entry, Descent & Landing. N-Sci and the Mother Goose Team/Mars Glider Teams are working to meet the needs of the New Strategic Plan as outlined by the President and NASA. Shape shifting Robotic Systems like MG have immediate impact in the human/robotic interchange in the future. Landed Human Astronauts will work in a tightly coordinated fashion with Robotic and Highly Autonomous assets in the future. The Mother Goose and Mother Goose Lite concepts will be prominent theme in many of our future proposal efforts to NASA and to the New Explorations Systems office. The next in the series of MARS SCOUT Program Announcements of Opportunity is expected January 27th. The MG Team is considering response “options” to this upcoming opportunity. The MOTHER GOOSE Concept has always included the idea that Mother would come equipped with a group of “Goslings” capable of moving off on their own after the Mother Goose Glider touches down. There have been recent advances in this capability and these advances have been the topic of several articles in the news of late. “Microbot Madness: Hopping Toward Planetary Exploration” by Tariq Malik (www.space.com) and “Exploring Caves with Hopping Microbots” (www.spacedaily.com) provide information on some of the latest innovations, in this case from MIT. MIT is a significant team member with Penny Boston on a NASA Institute for Advanced Concepts (NIAC) effort. View theses articles when you get a chance, you’ll find them quite interesting! Pictorials show close up of one of the MIT Microbots and a Microbot “swarm” on the surface. The next MARS GLIDER OPEN HOUSE is being planned for the springtime. 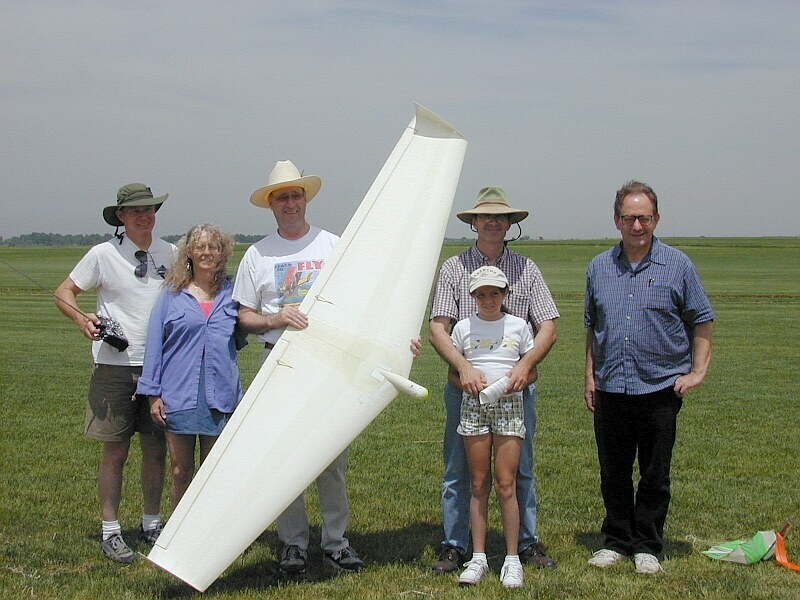 This event will again be located at the local Turf Farms (near DIA) and will be dedicated to the first flight of the 21-foot wingspan glider. The Team has continued its search for a local Mars Analog site. Initially the team considered the Deer Creek Canyon area for the first Mars Analog flight. This site is not acceptable due to local county ordnances not allowing flight in the Public Open Space. The Lockheed Martin Facility in Waterton Canyon is a possibility. Other alternate sites also being considered in Boulder County. The 12-foot wingspan vehicle is being upgraded for more flight-testing to check out camera systems and interfaces at the Mars Analog site. We are also looking forward to an “ultimate” Mars Analog checkout flight in UTAH. 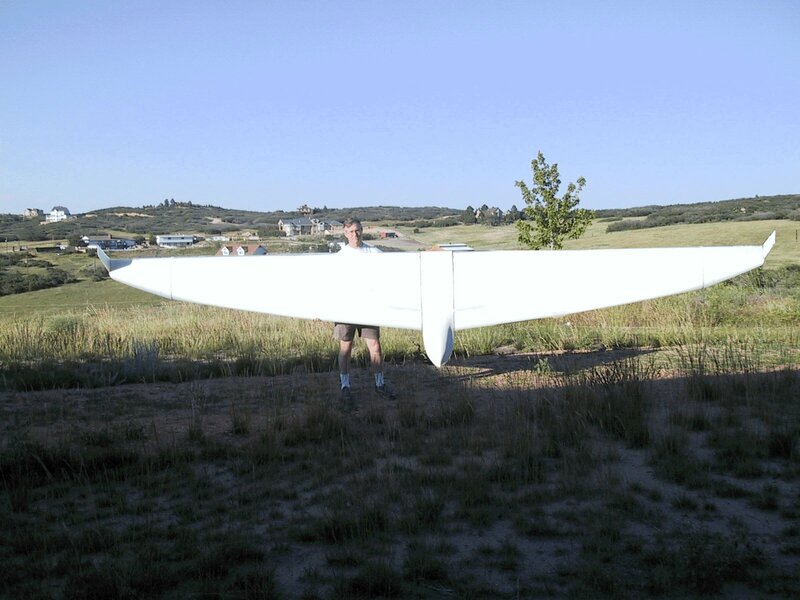 The assembly on a 21-foot wingspan vehicle is complete and the vehicle has had some checkout and test flights. N-Sci has recently provided additional R&D funding toward vehicle improvements to provide critical telemetry data. This telemetry equipment has been installed and a first test flight with active telemetry data stream has been completed. At 21 feet, this vehicle is considered to be quite representative of the size of inflatable wing vehicle that will ultimately be required to soar in the Martian sky. 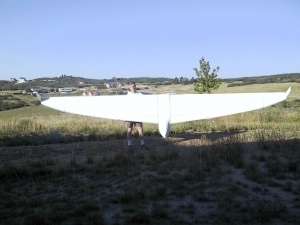 The new full-scale 21 foot glider. 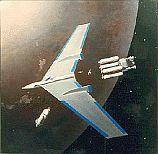 An article highlighting the Mars Glider project appeared June 12, 2002 on space.com. In other Mother Goose News, there have been some preliminary discussions with the Denver Museum of Nature and Science regarding the possibilities of the Museum’s participation with the Mother Goose Team. Several avenues are under consideration. The Museum is interested in the possibility of a Mother Goose “static” display as part of the Space Odyssey Planet Mars Exhibit. We are also looking at the so-called NASA “Centennial Challenge” program, specifically, the Planetary Air Vehicles challenge. The Museum is considering becoming a team member with us in a response to this challenge. STAY TUNED….! N-Sci and the VIEWS™ Team continue to seek opportunities for introduction of VIEWS™ technologies. There have recently been new discussions with Pathfinder Systems on the utilization of Pathfinder VICTOR™ technology within the framework of VIEWS. Pathfinder fielded a VICTOR™ prototype for the US Army at Fort Knox. N-Sci Views Team is coordinating a Non-Disclosure Agreement (NDA) with the Ministry of Transportation (Ontario) in response to a technology Request for Information (RFI) to our Viway Program.